There are few technological innovations right now that hold a greater potential for truly personalized marketing than the Internet of Things (IoT). Thanks to devices like wearable fitness trackers, remote-accessible home services, and voice-activated digital assistants like Amazon's Echo, consumers are growing more comfortable with trading their personal information in exchange for convenient, on-demand access to the brand experiences they desire. This shift in audience behavior has certainly not been lost on trend-watchers. 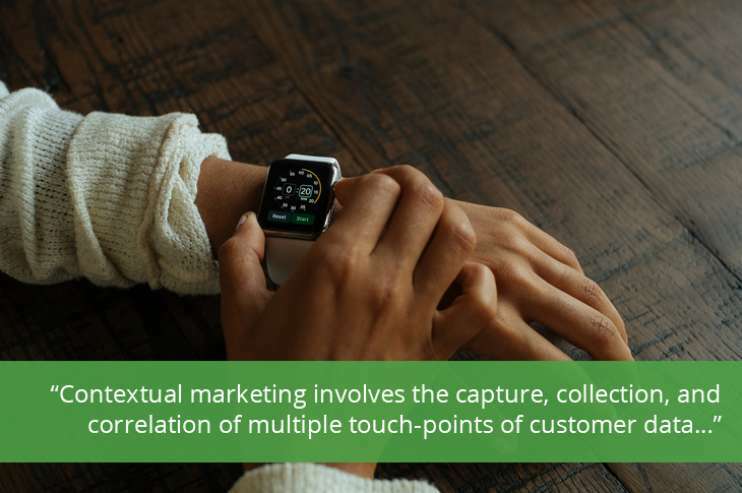 In fact, according to new research from renowned digital market analyst Rebecca Lieb, the latest wave of hyper-connected systems and cloud-based services is opening up a whole new world of marketing opportunities through the use of contextual communication. Contextual marketing involves the capture, collection, and correlation of multiple touch-points of customer data, which is then applied to the delivery of useful information and time-saving services that seamlessly bridge the digital and physical worlds–think smart refrigerators that keep a running inventory of the items kept inside and can trigger an automated online purchase when certain supplies are running low. The Home Depot app allows consumers to search for the products they need, check the nearest Home Depot location for product availability, and get the precise location of that item on the shelves, making it easier for them to navigate what can often be an intimidating and time-consuming shopping experience. MGM resorts serves recommendations based on guests locations and interests, loyalty member status, and stated travel preferences. Not only do customers' mobile phones conveniently serve as their room key, it's also their access point for hotel services, their guide to local attractions, and their broker for discounts on shopping, dining, and future room bookings. While it's true that the potential to serve relevant, targeted marketing experiences is driving a lot of excitement and enthusiasm for IoT technology right now, this technique may not be a good fit for all brands – particularly those that are tech-phobic, highly-regulated, or particularly risk-averse. As contextual communication is still very much a developing field, we suggest that most brands would do best to adopt a test-and-learn approach to determine where these efforts can add the most value. Know What You Want To Achieve: Contextual campaigns can require a significant investment in terms of development time and resources. Have a solid reason for using contextual messaging, and clearly outline your value proposition–for your customers and your business–at the outset. Know Your Customers: You need to have the right consumer insights–such as behavioral, demographic, location and browsing history data–to inform the development of a contextual campaign, which means moving away from impersonal, cookie-based targeting and towards more personalized tracking techniques. Know How To Work with Your Data: All this data means you will need robust data management tools that are capable of gathering data from multiple touchpoints, correlating the insights, and segmenting your audience for optimal targeting. Know Your Brand Voice: You need the right tone, voice, and offers if you want consumers to invite your brand into their connected experiences. Get too familiar, or fail to provide real-world value and you risk coming off as a creepy intrusion rather than a helpful lifehack. Know Your Stuff When It Comes To Technology: Make sure you have the infrastructure in place to support two-way, always-on communications, as well as team members who understand the ins, outs, and broader implications of working in uncharted technological territories. Know Your Customers' Opt-in Preferences: Brands will need to communicate the precise value for consumers, and get their voluntary participation in the experience, in order for these types of campaigns to take root and grow, at scale. Know Your (and Your Consumers') Legal Rights and Responsibilities: The success of contextual communications will largely rely on customers trusting businesses to manage their interactions securely, apply their programs ethically, and protect their privacy. Overstep your boundaries or overlook your responsibilities and you could damage your brand irreparably. Since our beginning, the Prove team has always stressed the importance of delivering the right marketing message to the right audience at the right time. In fact, it's one of the guiding principles of our Acqretention™ process, which enables us to turn prospects into buyers at an accelerated rate and lower costs. If you are ready to add the all-important fourth dimension of context to your messaging strategy, let us be your guide to achieving greater levels of tech-enhanced marketing success.